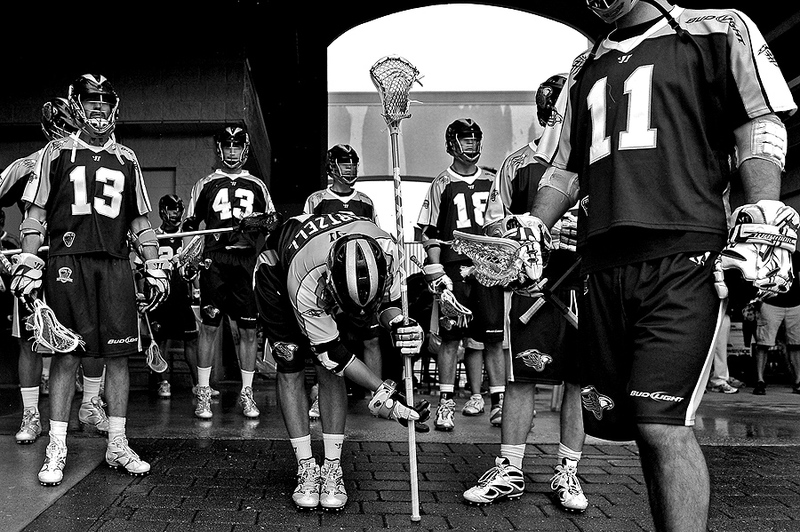 "Heavy rain from Hurricane Irene falls on the Chesapeake Bayhawks before they take on the Boston Cannons at Navy-Marine Corps Memorial Stadium on August 27, 2011 in Annapolis, Maryland. The Bayhawks would be eliminated by the Cannons in the Major League Lacrosse semi-final." Shooting two lacrosse games on Saturday was difficult. Heavy rain fell and strong winds gust the entire time, so keeping the front element of my lenses clean, dry was almost impossible. I realized that keeping a second body with a wide-angle lens with me would be a hazard because several inches of water flooded the field. So keeping it dry and safe would have been an added pressure aside from trying to get images in focus with the torrential downpours. Alas, this was one of the few wide frames I got off and liked before stashing the wide in the dry press box. Only if ThinkTank Photo would design a, in my opinion, long awaited rain cover for a pro body and wide lens - then I wouldn't have been so scared of drowning a camera and lens.